Haven't had my hair this short since April 2005.
very neat hair cut, i like it! I Love it! It looks good on you. . . Hope to see U and Ron soon. it's great on you =) refreshing! Wowwwwww.... what a look! I like it ading ko. You look good. Take care. 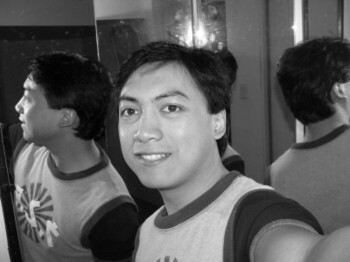 try mo kayang magpa semi- kalbo para pareho na tayo, kahit anong hairstyle bagay sa'yo!!! hey bro..... great look. you look like more happier and contended in life. that's more like it. cool smile. Godbless. keep in touch brotha. WE LOVE YOU!! it looks good on you, although mas nasanay akong curly hair ka. ahihihi garooooooooooo that's more like it! i love that look ahihi! muahhhhhhhhh! Cute naman! I like that . Mukhang dating Edgar when me and your mom saw you in Calgary. It become you. Got to see your blog and you did a good job. You should be very proud of yourself and keep it going ,very interesting ,like reading a book,to be continued... I'll look forward to reading more. Sayang naman the old pics were deleted I had to have pics printed and copied in a disk just not to get to this accidents. Wow, you look so different....very dashing and cute!